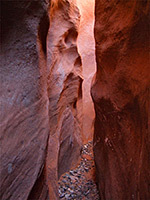 There are dozens of slot canyons along the north shore of Lake Powell, around North Wash, Trachyte Creek, and less accessible places further southwest. Some are long and deep, others much shorter, and many are quite easily accessed, being close to highways 95 or 276. 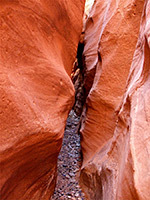 A few narrow ravines are found further west including one right next to the south end of Hwy 276, adjacent to the Glen Canyon NRA visitor center at Bullfrog Bay, where one fork of an unnamed drainage forms an enclosed lower slot of about 700 feet, and some longer, less confined narrow passageways higher up. 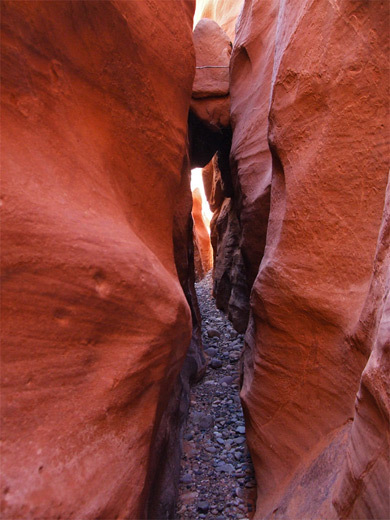 The darkest part of the slot is only about 30 feet deep, and the canyon may not warrant a visit were it located in more remote surroundings, but the proximity to the main road makes a quick explanation worthwhile. Another fork of the canyon has more sharply sloping narrows, as it cuts into a line of low cliffs that border Bullfrog to the north. Parking for the hike is in the main lot at the NPS visitor center, from where the drainage can clearly be seen, 200 feet north. Although shallow, the majority of the streambed is inaccessible due to sloping sides, but a less steep section allows entry a little way downstream, descending to a temporarily wide part. 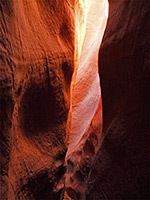 Not far below, the canyon narrows to a tight slot through smooth Navajo sandstone, colored rich shades of red and orange. The passageways hold a few small drops with minor pools after rainfall, and some sections require sideways walking, being less than 2 feet wide. The narrows open out at the junction with the much wider main fork, right beside the road. Some people might find the slot easier to explore by walking up from below, approaching along the south bank then descending a short slope. 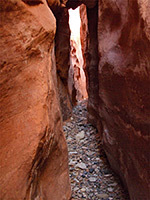 Though very brief, the narrows are deep enough for nice patterns of shadows and reflected light, illuminating the rocks in a range of subtle shades. There is one unusual obstacle; the darkest section of the slot, in summer, is the preferred breeding ground for thousands of daddy long legs spiders, in places completely covering the walls with a dense mass of insects stretching for several feet. The slightest touch sends the whole colony scattering in all directions. The main (north) fork of the drainage heads north, running directly beneath the NPS Bullfrog Bay campground, and enters a vertical-walled channel about 50 feet deep though relatively wide, which, after a couple of dryfalls, becomes shallow and splits into four tributaries, all forming very short slots as they meet a line of sloping, layered cliffs of stripy, red and white sandstone. Footprints suggest that the canyon system is explored quite often, perhaps mostly by people staying at the campsite. 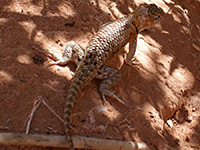 Like all of the Lake Powell region, the place is very hot in summer, so other seasons are the preferred times to visit.